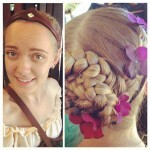 Renaissance Faire Instagram Flashback - Hello, Kristina! 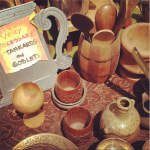 I love Renaissance Faires. I really love them. Usually I manage to make it to about one a year but in 2014 I’ve had the good fortune of attending THREE. 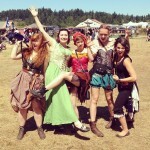 I got to check out LA’s Pleasure Festival back in April, then I finally finally finally got to attend Faerieworlds down in Oregon in July, and I wrapped up my Renaissance circuit with the Midsummer Fantasy Faire right here in Washington this past weekend. I figured I would put together a compilation of photos from the events to share the experiences with you, dear readers. Photos go a lot further when it comes to these events. Row 1: The SoCal Pleasure Faire with Ariana, Tyler, Sammy and Joe! This one was so big we didn’t even realize we’d missed a whole section of booths and shops until the faire was almost over! We spent the day shopping, eating, and enjoying the fact that it wasn’t 100 degrees out, like most Faires we usually attend. 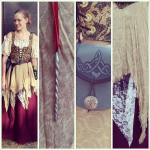 That second picture has detail shots of all my new medieval swag (the best part of attending a Ren Faire is adding to your outfits each year; I’m totally guilty of overspending all the time). The third picture was just a funny vendor that made me laugh. 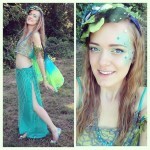 Row 2: Faerieworlds is my new favorite event of all time. 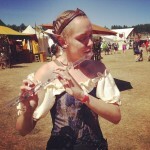 It’s sort of a Renaissance Faire meets music festival, and it’s right outside of Eugene, Oregon. I attended with some of my best friends: Eia, Joe, Justin, Ariana, Jenn and Liz. You set up camp, you shop, you dance, you listen to live music and you seriously unplug from everything else. We started the weekend in elaborate mythical creature costumes and ended up wearing next to nothing as it got hotter and dustier. 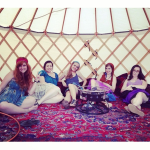 That second picture is a bunch of us hanging out in a yurt that Ariana was totally in love with… they just left it open all the time, so it became our go to chill space when it was too hot during the day or too cold at night. The stage with constant folk music playing was a serious highlight, as was the fact that most booths and food vendors stayed open at all hours of the weekend. 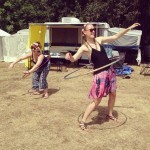 However, my favorite part was that there were workshops and activities for everyone – I spent a good amount of time with hula hoopers, learning new tricks (as you can see in the third picture) – while the others were at sword fighting workshops. It was truly amazing. Rows 3: This was our first day at the Washington Midsummer Renaissance Faire with Eia, Ariana, Joe and Meagan. It included immediately getting my hair braided (because it was way too goddamn hot) and putting Eia in jail. It was her birthday, so it seemed like the thing to do. These guys publicly “arrested” her and dragged her over to be contained until she tap danced for them and sang Happy Birthday to herself. 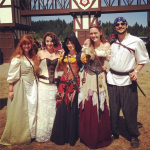 This is the Faire I’ve been going to since high school, so it’s always fun to run into familiar faces and delight in how much the event grows each year. Row 4: The second day of the faire was absurd when it comes to impulse buys for just about everyone involved in the trip. Also Liz joined us. I bought mermaid ears (can you believe it!? 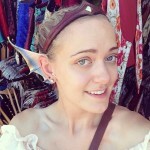 mermaid ears that look totally amazing!) and a crystal flute. I’m not even joking you. If someone told me as a child that I would spend my hard earned adult money on mermaid ears and a crystal flute… well… I probably wouldn’t have been surprised. I was a weird kid. 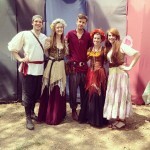 So that was my Renaissance Faire experience for the year, and I’m terribly saddened that it’s over for now. There are always yuletide feasts to look forward to, but I’ll miss the dusty paths of the faire, the turkey legs, the bards, the bodice ice. Until next year, huzzah! 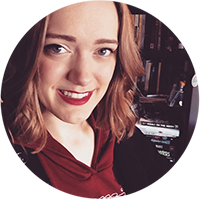 Life Update and Content Digest!